I have proudly partnered with Hanes for this post. We are a family who loves to travel. 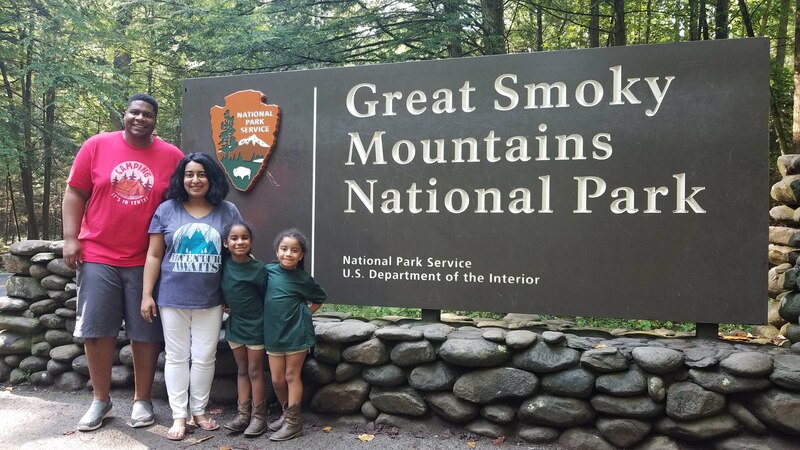 This fall, we had the opportunity to explore Great Smoky Mountains National Park, located in eastern Tennessee and western North Carolina. Great Smoky Mountains National Park offers breathtaking mountain views of the southern Appalachian Mountains, miles of hiking trails, and incredible fishing opportunities from crystal clear waters. This alluring landscape combined with its easily accessible location and lack of entrance fees are some of the reasons why it is one of the most visited national park in the nation, with nearly 11 million visitors annually. The Cherokee once described the Smoky Mountains as shaconage, meaning “blue, like smoke”. The mist, which gently clings and fills the valleys throughout the year, gives the park one of its most distinctive visual features. With over a half million acres of land and 2,000 miles of water within the boundaries of the park, I knew there would be some large rainbow trout lurking on the edges of some fast moving water pockets. I was determined to help my daughters land at least one of them during this trip. My daughters have an unabashed love for the outdoors, with a special affinity for fishing. Even at the tender age of four and six, they’ve caught a range of fish that would astound even the most discerning angler. There is a special thrill and satisfaction in catching a fish with a lure you’ve created with your own hand. After giving my oldest daughter an evening lesson on fly tying, I allowed her to create her own pattern for this trip. She decided on a large wiggly worm pattern that would perfectly match her pink Hanes Beefy-T T shirt. When we entered the Great Smoky Mountains National Park, our first family excursion took us to Cades Cove. Cades Cove is a 6,800 acre valley nestled on the western edge of the park. . It offers an attractive setting to view wildlife and explore numerous historic buildings from the early 19th century prior to the designation of the national park. On Wednesdays and Saturdays from early May to late September and selected days in December, the loop road to Cades Cove is closed to motor vehicles until 10am to provide cyclists and hikers a peaceful opportunity to ride and explore the park without automobile traffic. We loved the unspoiled character of Cades Cove. The expansive valleys and imposing mountain views also make it a scenic and family friendly drive. There are numerous places to pull over for that perfect photo and with so many visitors, someone is always willing to snap a quick family photo for you. Most people visit this area of the park during the summer and fall foliage season. During these times, the ride into Cades Cove can take upwards of two hours, especially during weekend in October. Crowds can be avoided by visiting off-season, or by starting your day in the park early before 10am. Since we were among the first ones into the park this day, we were able to enjoy the area and meander along some of the trails and open areas. We spent five fun-filled days exploring and making memories. The natural wonders found within the boundaries of Great Smoky Mountains National Park not only change with the seasons, but with every twist and turn you make on their well maintained roads and trails. We saw expansive pastures, gazed at seemingly impenetrable woods, walked to magnificent waterfalls, and played in rambling rivers. As we hiked and explored near and around the water, I quietly wondered when we could stop to catch a few fish. Would her fly also entice the massive trout we were looking for? On the last day of our trip, it was time to find out. As a reminder, you must possess a valid fishing license or permit from either Tennessee or North Carolina to fish in Great Smoky Mountains National Park. Either state license is valid throughout the park and no trout stamp is required. Be sure to learn more about license requirements and safety regulations before heading to any park for fishing. I found a slow moving section of water and set up our fishing rod. I attached my daughter’s pink wiggly worm and helped her send it into the edge of a riffle that undercut the opposite side of the bank. After a few casts with no bites, a flash of silver attacked her lure with such fury that the rod nearly slipped out her hands and fell into the water. She confidently set the hook and after balancing out the drag while keeping a firm grip on the bowed rod, skillfully landed a large rainbow trout. With great effort, I hid the tears of joy from my smiling face. At the tender age of six, my daughter landed a huge rainbow trout at Great Smoky Mountains National Park with a fly she tied. For five days, we were able to slow down and connect with one another while appreciating the natural beauty of these protected lands. It is truly comforting to know that these parks will be preserved and enjoyed for generations. This content is sponsored by Hanes, the official apparel partner of the National Park Foundation. As part of their partnership with the National Park Foundation, Hanes is developing a collection of tees which aim to inspire people from all backgrounds to connect with, celebrate, and support America’s national parks. This first-its-kind collection from Hanes brings to life the magnificence of our country’s natural, cultural, and historical treasures through authentic parks-inspired designs. I love our National Park system. Yellowstone is one of my favorite places on the face of this earth. Getting to share these natural wonders with our kids is priceless. loved reading about y’all’s trip to the Smokies! Awesome adventure! Thank you for sharing your adventure, I will have to take a trip with my daughter soon! So jealous of your family adventure. Can’t wait to get out to one of these National Parks and make these memories with Christopher and Joana.